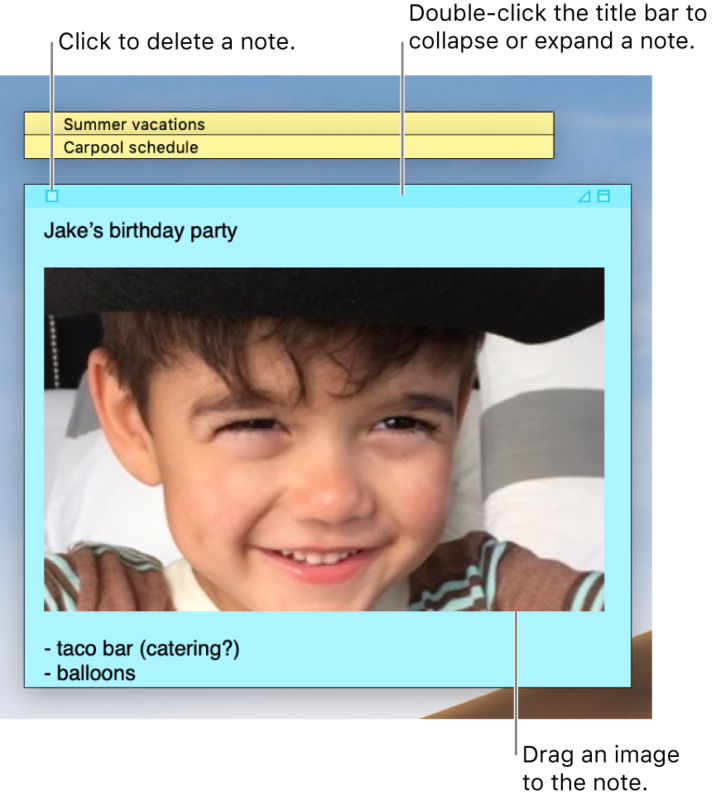 Keep notes, lists, and even pictures in sticky notes on your desktop. You see the notes whenever the Stickies app on your Mac is open. In the Stickies app on your Mac, choose File > New Note. Enter text. To add a picture or PDF, drag a file to your note. Your content is saved automatically. The first line of the note is shown in the title bar when you collapse the note. Change the note color: Choose a color from the Color menu. Change text formatting: Choose Font > Show Fonts. Select text, then use the Fonts window to format it. Make the note semi-transparent: Choose Window > Translucent. Keep the note in front of other windows: Choose Window > Float on Top. Tip: If you like how you formatted and customized a note, you can use it as a default template. Select the note, then choose Window > Use as Default. Add a list: Press Option-Tab, enter your first item, then press Return. End a list (and add a regular paragraph): Click at the end of the last list item, then press Return twice. Increase list level: Click a line in the list, then press Tab. Decrease list level: Click a line in the list, then press Shift-Tab. Format a list: Control-click in the list, then choose List. You can change the bullet type. In the Stickies app on your Mac, choose Edit > Find > Find, then type text in the Find field. You can also select text, then choose Edit > Find > Use Selection for Find. Select the current note or all notes. Deselect Ignore Case to find text that exactly matches the capitalization of your search term. Press Return to start the search. Click Previous or Next to move to another match. Note: You can also find and replace text. Enter the text in the Replace With field, then choose one of the Replace options. Arrange a note manually: Click the top of a note and drag the note where you want it. Group multiple notes: Choose Window > Arrange By, then choose an option. Keep a note in front of other windows: Choose Window > Float on Top. Make a note semi-transparent: Choose Window > Translucent. Collapse or expand a note: Double-click the title bar. Change the size of a note: Drag the note’s edge (top, bottom, or sides). To maximize the note, click the triangle in the top-right corner. Click it again to reduce the note to its original size. See note information: Hold the pointer over a collapsed note—you see when the note was created and last edited. 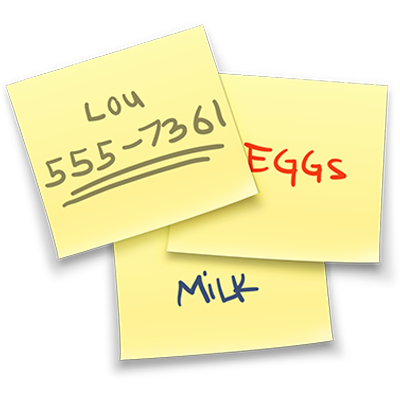 If you don’t see your note, verify that the Stickies app is still open. When Stickies is closed, notes don’t appear on your desktop. You can import a text file as a single note into Stickies or export a note from Stickies as a text file. You can also export all your notes from the Stickies app and import them into the Notes app, where you can write and organize notes in a single window and see your notes on all your devices. Import or export a single note: Choose File > Import Text or File > Export Text. You can import and export notes in common formats such as plain text, RTF, and RTFD (includes graphics). When you export text, you can choose where to save the file. Export all notes from Stickies to Notes: Choose File > Export All to Notes, then click Export All. Click the box in the top-left corner, then click Delete Note.